Kitchen & cold running water. Stay in one of our Rustic Large Cabins. 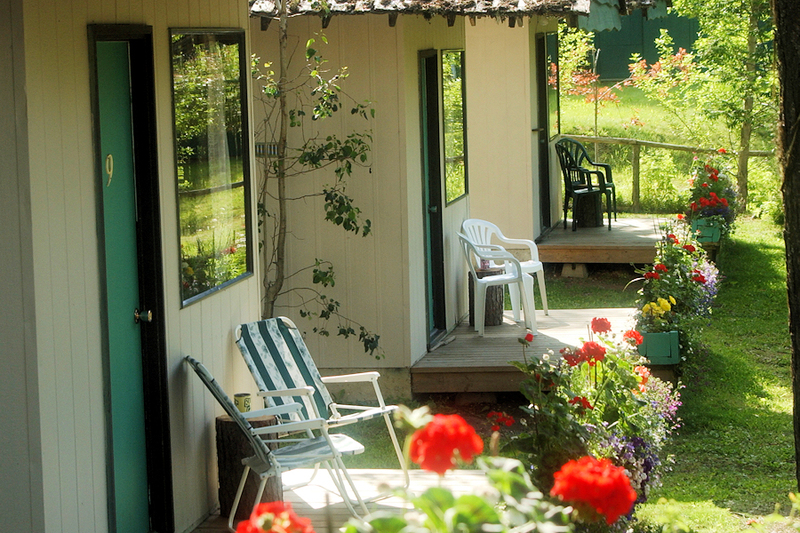 Elysia Resort has 4 rustic large cabins. All have one stand alone bedroom with either 2 single beds or a double bed. Plus, there is a sleeping area in the combination livingroom/bedroom area with either 2 single beds or 1 double bed. Each rustic large cabin has a fully equipped kitchen, cold running water and use of a central bathhouse. Linen and towels included. Maximum 3-4 people. Pet friendly $5/day, maximum 1 pet. Additional people are charged $10/day each to a maximum of 4 people total per unit (children 5 and under stay free). Discount for Weekly Stays: 7th night is free when staying for 7 or more consecutive nights. Applies to lodging only. * Prices are in Canadian funds (CAD) and do not include taxes. Prices are subject to change without notice. All quoted prices include: Full use of resort facilities and amenities. Note: Moorage, Taxes and Gratuities are extra. Includes: One of our Large Rustic Cabins (as above) and all meals; breakfast, a la carte lunch and dinner (hearty packed lunches for fishermen and outdoor enthusiasts), full use of resort facilities & amenities. Kids 5 and under stay free. Kid-size meals are extra from an a la carte menu. Kids 6 – 9 are $65/day for kid-size meals and accommodation. Those aged 10 and over are considered adults. Bookings are confirmed with a 50% deposit. Deposits are nonrefundable, but with 60 days notice may be transferred to another available date in the same season. Your deposit confirms and guarantees your reservation. If you fail to show, or cancel outside of the agreed cancellation policy time period, we reserve the right to charge the full amount of your intended stay to the credit card number given at time of booking. We accept Visa and MasterCard. Your authorization to use your Credit Card number for deposit and/or final payment indicates your compliance with our booking terms and conditions, whether or not you have actually signed the appropriate draft. Verbal authorization of your Credit Card confirms your reservation. Prices are quoted in Canadian funds and based on prices current at the time of printing. These prices may be subject to change without notice. Check-in: 3:00 P.M. 3:00 P.M. Guests planning to arrive early in order to participate in recreational activities are welcome to, however they will usually not have access to their room until 3:00 p.m.
Check-out: 11:00 A.M. Late check-outs can be arranged with prior notice. Reminder, we are a small resort. So, don’t delay, book now to avoid disappointment.